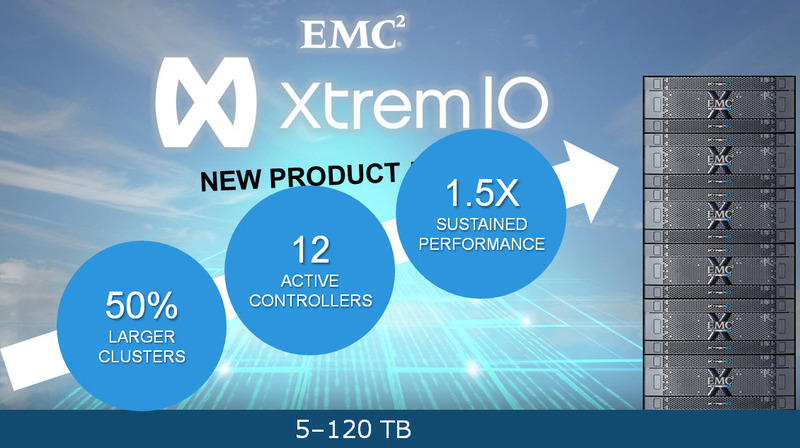 Since XtremIO first became Generally Available back in November 2013 the momentum of the product has been incredible. Becoming the ‘Number 1’ All Flash Array (AFA) on the market in just a matter of a few months and crossing the $100 million mark in less than 6 months of GA. 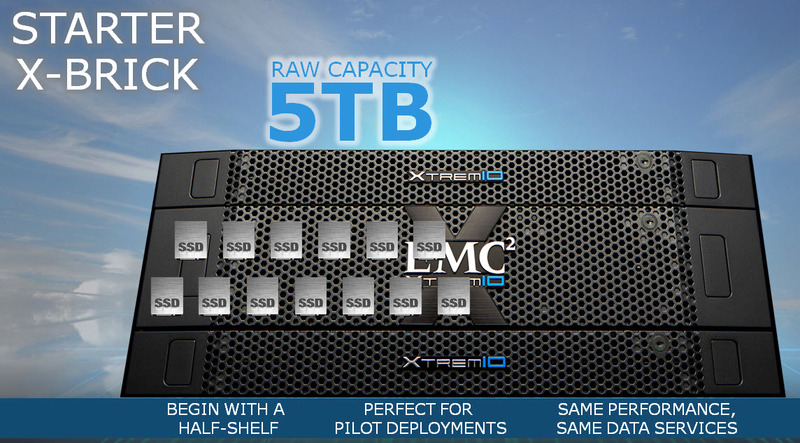 These statistics make XtremIO the fastest growing storage array on the market today. 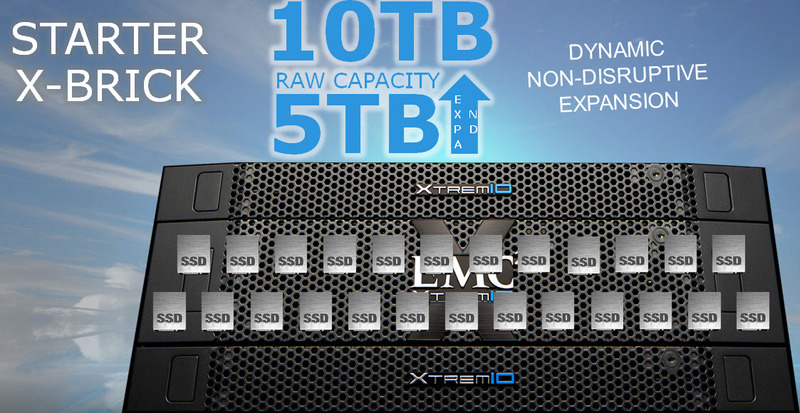 EMC have now added two new offerings to the XtremIO product line, a smaller 5TB single X-Brick and a larger six X-Brick configuration. New inline software Data Services have been added which result in an increase in performance, security and usable capacity. XtremIO customers can receive these new Data Services as a software upgrade to the XtremIO Operating System at no additional cost. Previously the XtremIO product offering was for 1, 2 or 4 X-Brick configurations, with a maximum of 8 active storage controllers and 80TB of capacity. The additional smaller X-Brick configuration called a “Starter X-Brick” is essentially the standard single X-Brick configuration with half a shelve of SSD Drives. The half shelve equates to 13 x 400GB drives in a 25-drive enclosure, providing 5.2TB raw and 3.7TB of usable storage. The Starter X-Brick is a great option for customers looking for the same peformance of a full X-Brick, but do not initially require the 10TB of raw storage (8.2 TB usable) available with a full X-Brick. This for example is a perfect starter system for a VDI pilot deployment of 500-1000 desktops, providing the same perfomance, the same data services and features as the fully populated system. If you require the full 3500 Desktops then you may dynamically add the additional SSD’s to make a full shelve and the capacity will expand online non-disruptively. The Starter X-Brick is availble now with code level 2.4.1-12. The new larger 6 X-Brick system consists of 12 active controllers which provides a 1.5X increase in performance and a 50% larger cluster configuration. Outside of the hardware improvements, EMC are now adding 3 new always-on and always inline data services to the XtremIO Array. D@RE encrypts all the data that is stored at rest on the SSD’s in the array. Even though the drives are encrypted, the performance is not impacted because of D@RE. The reason why the performance of the array in not impacted is because the encryption is being handled inline in the data path. D@RE leverages self-encrypting SSDs with AES256 encryption. The array management control system locks the SSDs ‘media encryption key’, thus if any of the SSDs are taken or removed from the X-Brick the data on the SSD is unreadable outside of the XtremIO array. Existing and new 20TB X-Brick Customers can take advantage of D@RE if they wish to do so; as this is something that every 20TB X-Brick that shipped from the factory was already pre enabled for D@RE. For the 10TB X-Brick D@RE shall be available with any new X-Brick moving forward. D@RE is availble with code level 2.4.0-25 and above. The second new Data Service is Always-On Inline Compression, which compresses the unique blocks that remain in the array after deduplication, with no performance penalty. 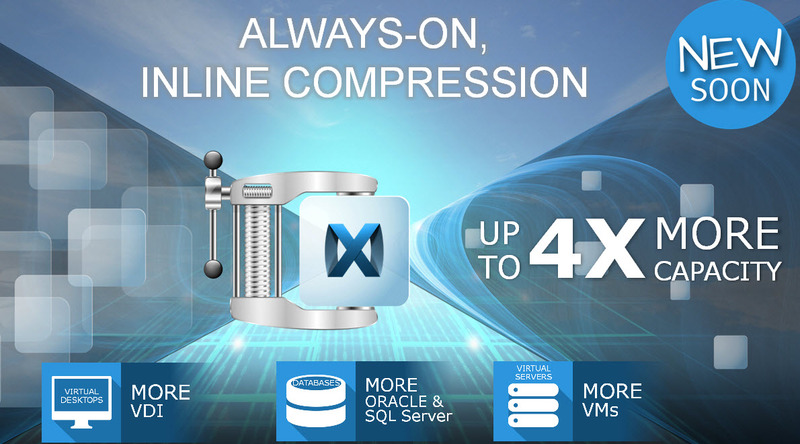 Typical application sets compress up to 4 times more, so it will be like getting free capacity out of your existing XtremIO array once the software upgrade is enabled. Availble with code level 3.0 Q42014. Note: Today XtremIO combines deduplication and Thin Provisioning on every block of data as it comes into the array, so only new unique 4k blocks get written to the SSD’s – resulting in data reduction of anything between 5:1 – 20:1 depending on your workload! Agile Writable Snapshots is the third advancement which is now available. XtremIO’s snapshots are totally in-memory, with 100% space-efficiency for both user data and the metadata that describes the volumes. These snapshots apply a clean-sheet approach specifically for flash, leveraging inline data reduction capabilities to only ever write unique changed blocks. As a result, all snapshots, parents and children, have full performance, are created in-memory in milliseconds, and there is no performance degradation regardless of how many snaps you create. All snapshot operations including creates, deletes and IO operations all occur in RAM, thus perfoming at RAM speeds. Snapshots are availble with code level 2.4.0-25 and above. Not clear from your blog what the drive increment is when going from X Starter Brick and 13 drives to the full 25. Also the 6 brick offering maybe nice, but what happened to the previous 8-Brick offering. Meanwhile the EMC list price for a 800 GB drive at $24K is completely out of whack with the market. It seems like they are trying to relaunch things that did not previously work very well such as there deduplication software. Is this more to convince senior management at EMC that the XtremIO group is making progress or an attempt to convince customers that EMC really has the pedal to the metal on this one? Increment from 13 to fully populated 25xSSDs DAE. Is the six brick version available for purchase today?